The gap between Brazil's far-right candidate Jair Bolsonaro and the Workers’ Party presidential hopeful Fernando Haddad, who will face off in a runoff on Sunday, Oct. 28, closed from 18 to 12 percentage points in one week, according to a survey released by pollster Datafolha on Thursday. 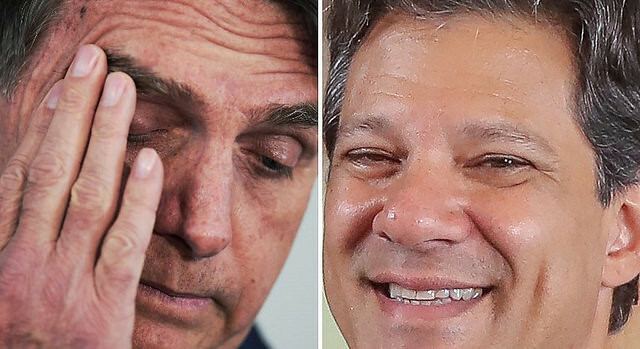 Three days ahead of the elections, the opinion poll shows Bolsonaro is at 56 percent of voting intention, while Haddad is at 44 percent of voter support. The previous poll, conducted between Oct. 17 and 18, Bolsonaro was at 59 percent and Haddad was at 41 percent. Datafolha interviewed 9,173 voters in 341 cities on Oct. 24 and 25.